Eileen I. Brabender, 87, of the Harbor Club, formerly of Thomas Circle, Port Washington, Wisconsin died June 29, 2009 at her residence. 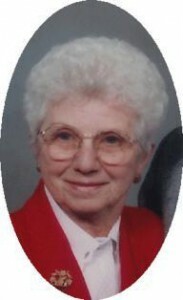 She was born June 13, 1922 in the town of Saukville to Fred and Clara VandeBoom Bell. On June 24, 1944 she married Harry M. Brabender of Port Washington in Joplin, Missouri. They made their home in Port Washington on N. Wisconsin Street for many years and later moved to Thomas Circle. She was homemaker and cared for her family. She was a proud mother and grandmother and devoted wife, caring for her ailing husband for 12 years, always by his side. Her husband Harry preceded her in death October 6, 2006. Eileen was a member of St. Mary’s Parish and their Christian Women. She was also active with the Port Washington Senior Center and the former St. Alphonsus Hospital Ladies Auxillary for over ten years. She enjoyed ceramics and making crafts, baking cookies and never left her house without something to take along. An ambitious and spunky women for her size, she will be remembered as always being helpful. She is survived by her daughters Carol (Mel) Birkholz of Port Washington and Karen (James) Lavora of Belgium, grandchildren Shelly (Roy) Hartmann, Kyle Cobbledick and Katie Cobbledick and great grandchildren Nathan and Nickolas Hartmann. Further survived by brothers Don (Eileen) Bell of West Bend, Jerry (Marcella) Bell of Saukville and Glenn (Kathi) Bell of West Bend, brother-in-law Norbert Berend of West Bend, other relatives and friends. Preceded by her husband Harry, grandson Shaun Cobbledick, sisters Elvera Berend and Gladys (the late Foster) Braby and an infant brother. Reverend Tom Lijewski will celebrate Mass of Christian Burial 6:30 pm Thursday, July 2, 2009 at St. Mary’s Church, Port Washington. Interment in St. Mary’s Cemetery. Visitation 3:30 to 6 pm Thursday at the funeral with a rosary at 3:30 pm. Memorials of choice appreciated.